I’ve learned that the best time to make big changes or start huge projects is while Steve is golfing. Let me give you an example. Years ago, in our previous house, I thought it’d be cool to build a bar for the game-room. A seven foot long bar. I planned it in my head each night instead of sleeping until I had to build it just so I could get some rest. I made the mistake of telling King-Veto my plans. He said, ‘Do Not Build a Bar’. Then he left for his early tee time with his brother Chris. Like the submissive wife that I am…. I went to the garage and started building. By the time they got home, it was mostly complete except for the bar top. They found me in the garage. Steve said, ‘what are you doing?’ It wasn’t an angry ‘what do you think you’re doing’, it was like he didn’t remember the bar/no bar controversy at all and was actually curious about what I was doing. So I said I was building a giant dog house. This was acceptable to him. A bar height, seven foot long dog house. In his defense, we did have a giant mastiff that would actually require a house of this size. He wasn’t fooled for long, but while he was Chris sure enjoyed it. 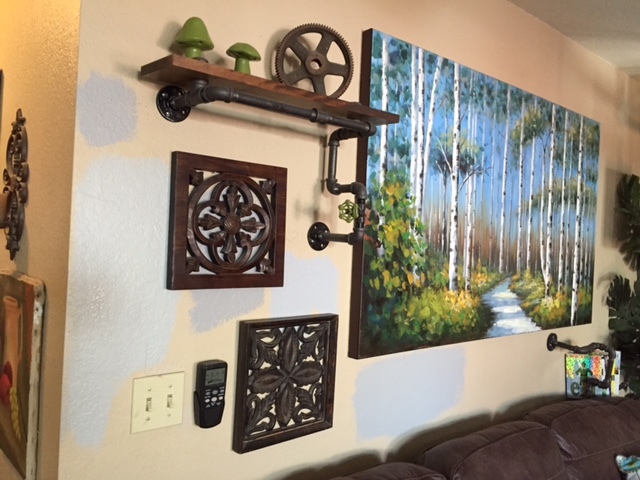 So, in my quest to find the perfect paint color I had to paint the walls gray-camo. I was worried that it would tip Ol’ King-Veto off about the start of a big painting job. But, when he returned from golf he didn’t even notice! He just came in and threw his keys down on the mantle. 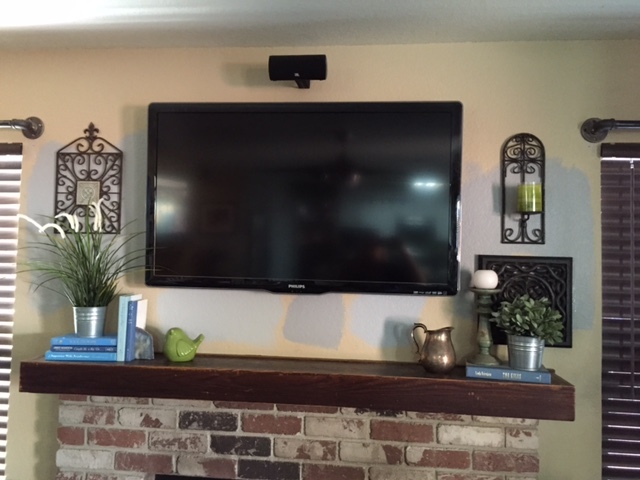 This mantle with the swatches painted right there! To be continued on the perfect paint color. I’m looking for a grayish color with a blue or green undertone. Not too much blue or green, not too light so it looks like dirty white and not too dark either. 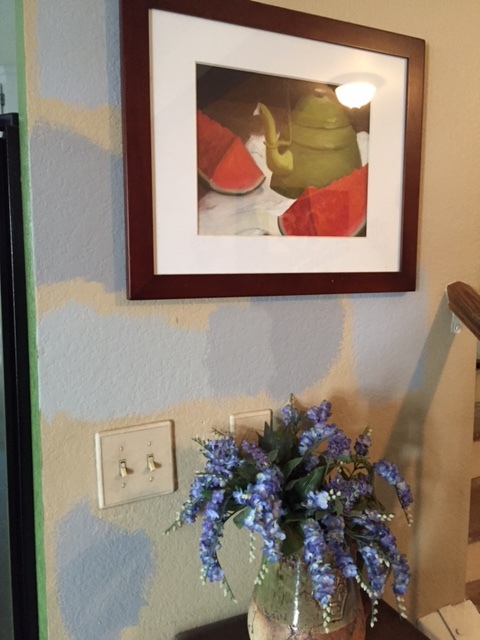 It’s an imaginary color that exists only in perfect light on HGTV. Impossible to duplicate in reality so far. I need a couple days to contemplate the colors, some times you just have to drink things through. Let’s have some wine! Terry got the first taste of this St. Helena California Chardonnay, she gave it a thumbs up! Kerri commented that she didn’t taste any oak and liked the floral bouquet. Arvin said, ‘not too bad for a white.’ We all agreed that the wasabi chips paired nicely with this crisp Chardonnay. On-line review from WineWithLisa: For those of you who are tired of heavily oaked and buttery Chardonnays, your dream has come true! 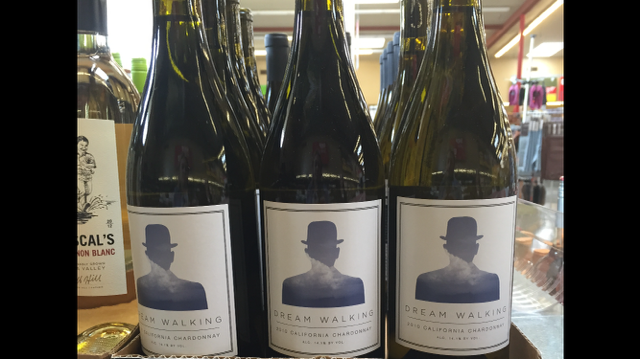 Cultivate Wines gives us a virtually un-oaked Chardonnay -Dream Walking- with the freshness and crisp acidity of meyer lemon and hints of pineapple,banana and green apple. Cooler growing conditions in the Mendocino and Santa Rita Hills subregions of California and fermentation without the use of heavy oak allows the freshness and fruitiness of this Chardonnay blend to stand front and center. Raise your wine glass to your nose,close your eyes and and inhale the subtle aromas of lemon peel,floral jasmine and fragrant almonds. Kerri started us off with this California Red Blend, she took a sip and tasted Red Velvet Cake! Rudy said it was excellent with the fresh raspberries, it really brings out the cherry flavor. Arvin tasted vanilla and Scott called it, ‘kinda nice’. Steve tasted black cherry and plum. He added that when paired with dark chocolate, it completely changed the taste. Rudy agreed, but preferred it with the berries. 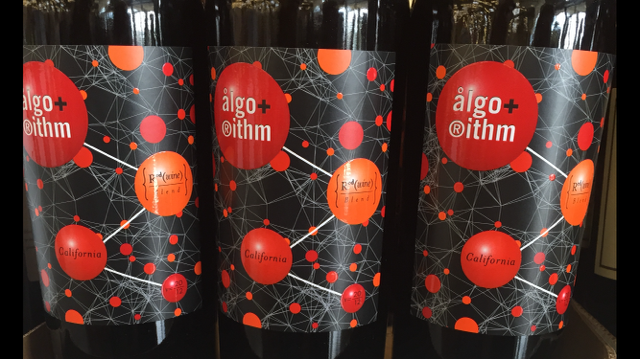 Tasting notes from the winemaker: The Algorithm Red Blend possesses a network of dark cherries and plums, interlaced with rich notes of chocolate and vanilla. Mature tannins create a silky backbone that is linked together with ripe, concentrated fruit flavors. 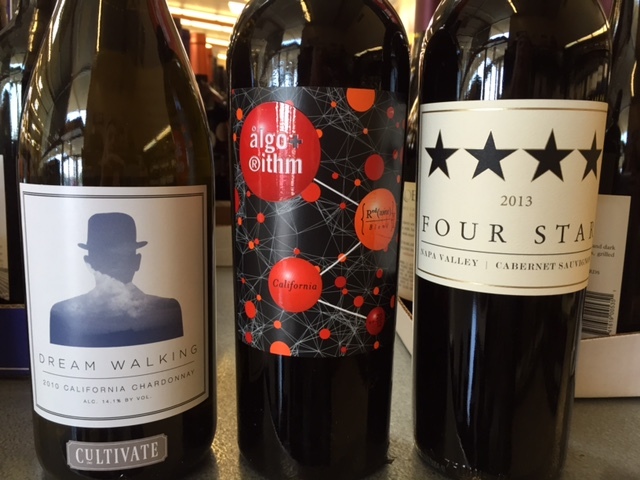 Enjoy young to fully appreciate its abundant fruitiness. 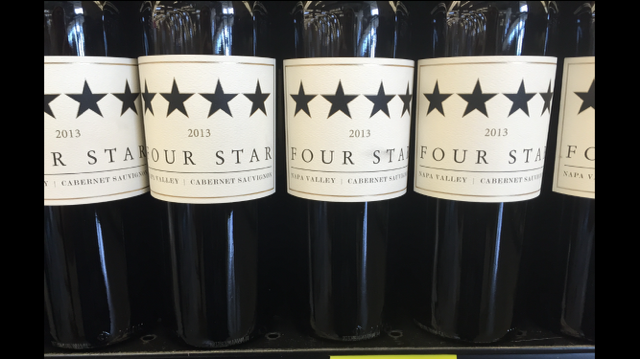 Larry thought this Napa Cab was more mellow than a traditional Cabernet Sauvignon, kinda like a red blend. Kerri liked the spicy & dry tampernero and liked the pairing with salted caramel brownies. Steve agreed with the dryness, he says he appreciates a dry wine.